Studio/Motel Rooms feature: Air Conditioning, Colour Televisions, Jug, Toaster, Microwave, Bar Fridge, Crockery & Cutlery, Table and Chairs, Iron and Private Bathroom, Wireless Internet. One Bedroom Apartments feature: Air Conditioning, Separate Bedroom with Queen-size Bed, Full Kitchen Facility (with Oven & Microwave), Spacious Lounge & Dining Area, Colour Television, Washing Machine, Clothes Dryer & Iron, Free Wireless Internet. Two Bedroom Apartments feature: Air Conditioning, Separate Bedroom with Queen-size Bed, Full Kitchen Facility (with Oven & Microwave), Spacious Lounge & Dining Area, Colour Television, Washing Machine, Clothes Dryer & Iron, Wireless Internet. 4 Bedroom Apartments feature: Air Conditioning, Separate Bedroom with Queen-size Bed, Full Kitchen Facility (with Oven & Microwave), Spacious Lounge & Dining Area, Colour Television, Washing Machine, Clothes Dryer & Iron, Wireless Internet. 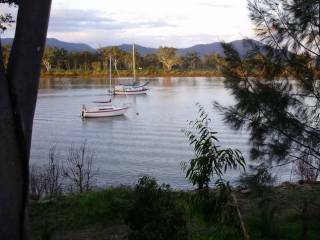 Coming to Rockhampton for business or pleasure? Tired of small and overpriced motel rooms? 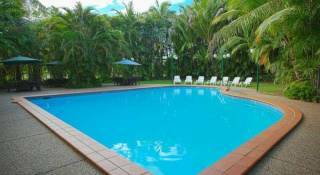 Rockhampton Serviced Apartments are ideal for families, corporate travelers or holiday makers. 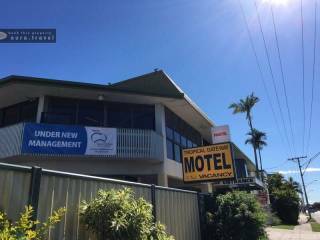 Located in the heart of Rockhampton, the Apartments provide relaxed and comfortable accommodations within easy walking distance of the city centre. The Rockhampton Serviced Apartments offer sleek, stylish & modern accommodation facilities, to make your stay as enjoyable as possible. All of our apartments offer extensive furnishings in comfortable apartment style accommodation. Please feel free to contact our friendly staff at any time with any queries you may have regarding our facilities. CHILDREN AND EXTRA BED POLICY: All children are welcome. One child under 2 years stays free of charge in a child's cot/crib. One older child or adult is charged AUD 11 per person per night in an extra bed. The maximum number of extra beds/children's cots permitted in a room is 1.